But sometimes even the Phoenix needs help… Africa is arguably the most misunderstood continent on earth in many senses. It hides secrets, treasures and ancient wisdom in the forms of lost civilizations, architecture, art and cultures. But there is one unit of scientists – very little known and unassuming – that is attempting to uncover and preserve at least a small part of Africa. Under the expert supervision of Professor Heinz Rüther, The Zamani Project was initiated in the Geomatics Division of the University of Cape Town and is currently funded by the Andrew W. Mellon Foundation. The project, founded as “The African Cultural Heritage Sites and Landscapes Project”, developed out of years of heritage documentation activities by Prof. Rüther. In other words, the Project attempts to capture the spatial domain of heritage, by accurately recording its physical and architectural nature and dimensions. Sites are seen in the context of their physical environment and landscapes surrounding sites are documented based on satellite and aerial imagery, wherever possible. The documentation project was initiated to increase international awareness of African heritage and provide material for research while, at the same time, creating a permanent metrically accurate record of important sites for restoration and conservation purposes.The project is based on state-of-the art data acquisition and presentation technologies, including laser scanning and close range photogrammetry, which are used to generate Geographic Information Systems, 3D computer models and other spatial data. The work is often complex and difficult in the field. The team has completed documentation work in Ghana, Mali, Kenya, Sudan, Egypt, Cameroon, Mozambique, Ethiopia, Tanzania and South Africa as well as Uganda and Algeria. So what are the main objectives of the project? “To provide data for the future, should sites deteriorate or be destroyed ,” says Heinz. “In our efforts to digitally record them we are trying to be holistic. We combine technologies and different ways of conveying information and also our data is used for conservation and restoration, which is an additional objective. At present the data is used for restoration, for instance at Lalibela in Ethiopia by UNESCO and the World Monument Fund and In Songo Mnara in Tanzania by an international team of conservators and archaeologists. The data can also be used for site management, for example at the Wonderwerk Cave in South Africa, the design of a tourist walkway will be based on our data. We also intend to use the data to create replicas (true to scale) of rock art shelters to allow people who cannot physically visit the sites to get an impression in 3D.” It seems the data has endless applications. 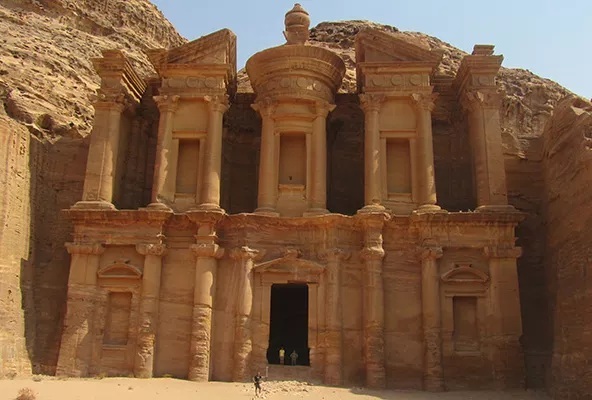 It can also be used, the Professor tells me, to assist in the control of the effects of natural disasters by providing, for example, information for the design of structures built to protect important archaeological sites from flooding. Rock art is especially exposed to vandalism and, while we cannot protect a site from destruction, our data can help to restore sites. The data can also serve to monitor changes due to erosion, human impact or sea levels rising such as in the case of the fortress on Kilwa Kisiwani in Tanzania which is right on the shore. “In Cameroon there are dry stone strong-holds where the structure of the original building is hard to understand by visual on-site inspection. The researchers working there hope to use our 3D models to restore or reconstruct damaged structures, and determine their original use.” Generally the data can be used to restore some semblance of life as it was before. So how did his passion for this line of research begin and why Africa? 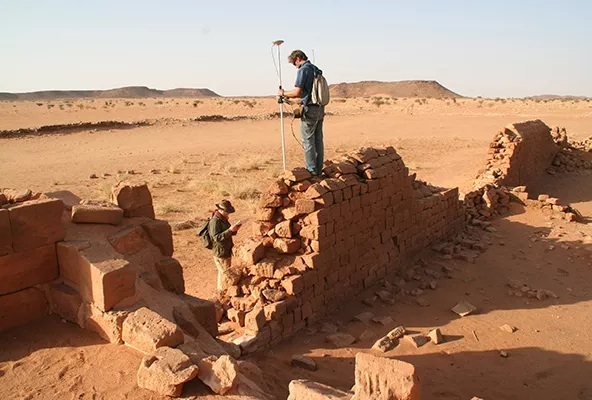 GPS survey at Musawwarat Es-Sufra, Sudan. He says the project has generally been well received by the countries in which they work. “At first there is some hesitation and suspicion and our motivation is often questioned – local authorities are wondering why we are doing this for free! But once the fieldwork begins, we include local experts and students for on-the-job training and once that happens and we show our results then they generally become very positive. Sometimes we are asked to do further sites.” The Professor says there are serious concerns about potential misuse of the data as well. “We are very careful to make the data available to respected bodies and researchers and scholars only. Unscrupulous tour operators and other opportunistic industries can do a great deal of damage. And we certainly do not want to see our computer models in the form of inappropriate or disrespectful video games. We only trust appropriate government officials, heritage authorities and accredited custodians with the results of our work and we are definitely not in it for commercial gain.” All the work is done pro bono and no one is ever charged a cent for his or her amazing services. Heinz says it is impossible to say how many sites there are still to be documented in Africa. “There could be hundreds more. In addition to historical and archaeological sites, there are also a wide variety of traditional hut forms in Africa reflecting cultural diversity and different responses to the environment. All these should be recorded before they are replaced with modern dwellings. How many other institutions around the world are doing similar work and to what extent? But the future of this amazing project is bleak. The biggest risk, however, is that these dedicated, deeply committed and passionate scientists may not t be able to continue with their work due to lack of funding. As a continent, we simply cannot afford to lose them. As they say, we are borrowing this land from our children and we owe them a vision of their past.